Why Are Construction Costs Rising? Rising construction costs are outpacing overall inflation rates by almost double, causing many developers to jumpstart their projects to avoid reduced profits. The trend isn’t expected to shift– the economy indicates that construction costs will continue to increase due to growth in demand, leading to higher a cost of materials and labor shortages. Economic pressures such as increased demand, rising fuel costs, and trade tariffs on both raw and finished materials are pushing the costs of materials higher. Tariff increases for metals and lumber greatly contributed to the 8.8% average rise in the cost of all goods used for construction between May 2017 and May 2018. These consistent price increases make accurate estimation of changing costs over the course of a project essential to maintaining your budget. Construction unemployment in the North Florida market has dropped from 40% to 3% over the last decade due to increased demand. For the first time in the history of the construction industry, average earnings exceed $30 per hour. With these labor shortages and increased costs, partnership with an established builder that has a skilled workforce and provides efficient schedule management is more important than ever. 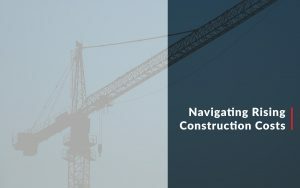 With steadily rising construction costs, it’s critical that a project is planned with a trusted partner that will deliver accurate estimates, the shortest possible timeline, and an efficient allocation of resources. Scherer Construction will work with you from the design phase through your project’s build to optimize costs and expedite the process, ultimately increasing your profits. The cost of construction will change throughout the course of your project. Our knowledge of the construction market allows us to accurately estimate costs for your entire project from the planning phase, so that you can avoid surprises and stay on budget. You can trust us to always give you an estimate that adjusts for the cost of construction over time, and bring any potential risks to light. Project timelines have become lengthened recently due to the time it takes to obtain permits. Scherer Construction offers permit expediting services for Design/Build and negotiated projects, simplifying the process and increasing profitability for our partners. We also have access to private plan reviewers and private inspectors, often minimizing the duration of the permitting and inspection process. Your project has limited resources, and we understand how to efficiently use those resources to reduce costs and optimize your space. Our expertise has enabled Scherer Construction to serve the Gainesville area for over 30 years. Let us use our experience to help you navigate the construction market, and create a project that generates the most value. For more information, Contact Scherer Construction.